Pearl’s Bagels is a hybrid Montreal and NY-style bagel bakery serving fresh hand-rolled bagels. We offer chewy-on-the-inside-crispy-on-the-outside bagels, plus spreads and a small selection of both breakfast and lunch sandwiches. Pearl's is focused on sustainably sourced ingredients, choosing local options where possible, so long as quality is not jeopardized. 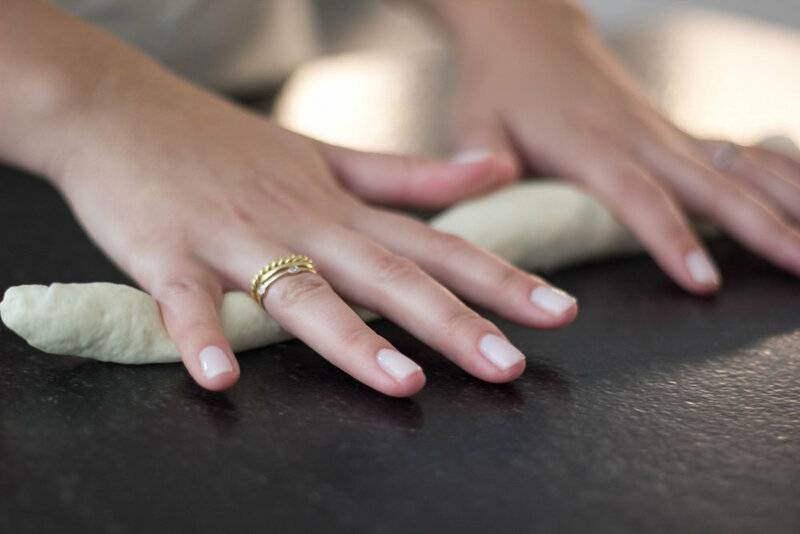 At Pearl’s, we believe bagels should be made of simple and abundant ingredients; that’s why we use just six ingredients – flour, water, salt, yeast, honey and a tiny bit of malt powder (to get that classic bagel-y flavor). We boil the bagels in water with a bit of honey before baking. Pearl’s Bagels was born out of nostalgia (and the craving for a tasty breakfast sandwich). Husband-and-wife team Allee and Oliver are from MA and NJ (respectively) and grew up surrounded by fresh, amazing bagels. Driven by the absence of good bagel options in their neighborhood, they began baking homemade bagels on weekends in their home kitchen. After getting married, leaving their media jobs and traveling the world for 5 months, they came home to DC and decided to switch career paths. They traded in their blouses/button downs for aprons and decided to bake full time to provide DC with the tastiest, chewiest, crustiest bagels the world has ever seen (ok, maybe a little dramatic…but we think they’re really good!). Pearl's Bagels is named after their beloved, sassy, brindle French Bulldog. Follow her on Instagram @worldofpearl.